Apartments are located in different areas of the city center, in buildings where other Italians live. By living in an Italian residence, and not in a dorm, you will be immersed in the Italian way of life and have the opportunity to establish relationships with other Italian natives. Each apartment is privately owned and is unique in atmosphere, size, design, facilities, floor plan and number of bedrooms. A typical apartment will be shared with 2 to 6 other AIFS-Richmond students. Apartments are fully equipped with: Internet, kitchen supplies, furnishings, blankets, two sets of sheets per student and a washing machine. All apartments are located within around 30 minute travel time to the Study Center. The cost of utilities is not included in the program fee and you will be asked to pay a deposit of 300 euros directly to your landlord upon arrival in Rome. Please note this fee will cover the cost of utilities, Internet and cleaning services per person, per semester. As a guest within an Italian family you will have your own key to the apartment to come and go as you wish. A large number of Italian apartments are occupied by a single person, so you are likely to be housed with a single woman or professional couple. Living with an Italian family gives you invaluable cultural insight and fast progress with the Italian language. The cost of utilities is included in the program fee for the homestay option. The program fee is based on a double room shared with another AIFS student although some Italian families may only take one foreign student at a time. Internet access is included. The meal plan is one of the highlights of the Rome program, with almost 100% of students rating it “excellent” or “good” every semester. Valued at approximately $1,300, as well as being incredible value for money, it gives you a unique opportunity to experience Italian food culture, dining alongside locals in selected restaurants or shopping in neighborhood grocery stores. In addition to occasional group meals and tastings, you will receive meal vouchers to subsidize the cost of purchasing meals. These can be used all over Italy, giving you the flexibility to eat out or pool resources and cook in your apartment or homestay with your fellow students. Students may opt out of the meal allowance and pay a reduced program fee of $14,995. 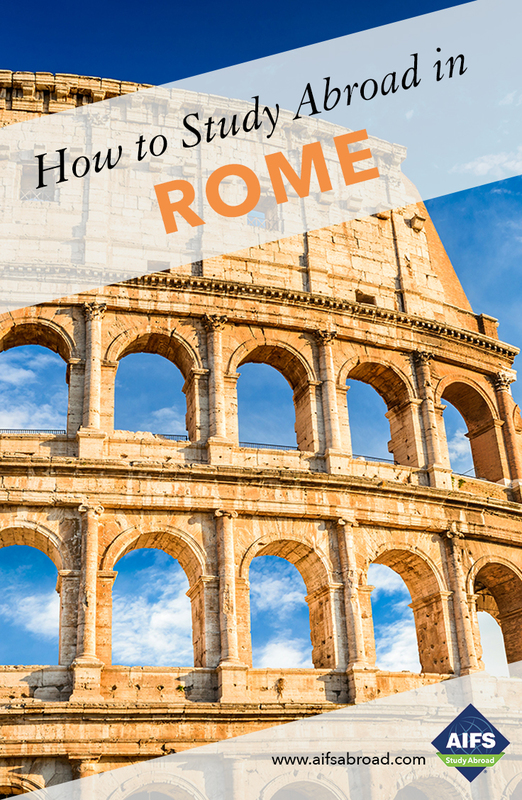 Students should budget approximately 40 euros for a monthly pass for unlimited travel on the Rome bus and underground system. Rome has an extensive public bus and train system that students can use to travel between their housing and classes. It is easy to walk to destinations in the center of town. We believe in experiential learning, and we know that education does not begin or end in the classroom. To help you get a true taste of Italian culture and reach out to the local community a wealth of cultural activities and excursions are included in your program fee. Visit www.aifsabroad.com for excursion dates. Please note that students may pay a small additional fee for some of the activities above. In addition, a Language Peer Mentoring Program as well as a conversation exchange program with Italian college students is available for all students. All programs begin with an immersive orientation. While you start learning Italian or refresh what you already know, the AIFS Richmond staff organizes a wide variety of cultural and social activities including workshops and lectures on health and safety issues, Italian culture and visits to some of the most famous museums, churches and palaces in and around Rome with professional art historians. Highlights are the visits to the Colosseum and the Roman School of Gladiators, Papal Audience and Vatican Museums, trips to Viterbo and the Hot Baths, Ostia Antica, Sperlonga, and to Assisi, birthplace of St. Francis, to enjoy its medieval atmosphere and experience an olive oil tasting. This program enables students to get to know many aspects of the society and community they are living in and to receive practical, hands-on training and work experience in one of a range of volunteer work associations. Whether students help to teach English in a local school or mail flyers for a local association, they will experience the real world through hands-on work and use this experience to explore major or career interests. Volunteering in Rome offers a unique opportunity to meet and communicate with Italians, to practice the language and to see another side of local culture. Students wishing to earn academic credit for their volunteer work can take the Service Learning and Active Citizenship course, a 3-credit course combining a community placement with written work, designed to provide students of all majors with the intellectual, professional and personal skills that will enable them to function well in the community and gain valuable life experience. The Service Learning course is based on the principles of civic engagement, ethical social responsibility and social justice. The assessment is based on reflective learning, social analysis and public problem solving. See page 358 for a full course description. Ciao! I have been with AIFS since 1995; first in Florence, and then in Rome. I received my Laurea (MA Hons) in Humanities from the University of Florence and a post degree diploma in Museum Studies from the University of Perugia. I studied abroad as a student, spending time in France, Spain and the U.K. I love yoga and traveling and I have visited many countries including the U.S.
Each semester is a new adventure and what I love the most is to experience Rome through new eyes and to hear about your stories and discoveries in our beautiful country. Together with my colleagues I look forward to advising and supporting you throughout one of the most empowering experiences of your life.